A TV ad against Democrat Andrew Gillum was still airing statewide as the Category 4 hurricane made landfall. The Florida gubernatorial race isn't stopping — even with a devastating Category 4 hurricane making landfall in the state. Republican candidate Ron DeSantis ripped Democratic Andrew Gillum — and pounded him with negative ads Wednesday — as Hurricane Michael hit the Florida Panhandle with life-threatening rain and wind. As of Wednesday afternoon, an anti-Gillum television ad, paid for by the Republican Party of Florida, was still airing statewide, including in markets in Pensacola, Jacksonville, Miami, Orlando, Tampa and Fort Myers, NBC News confirmed. 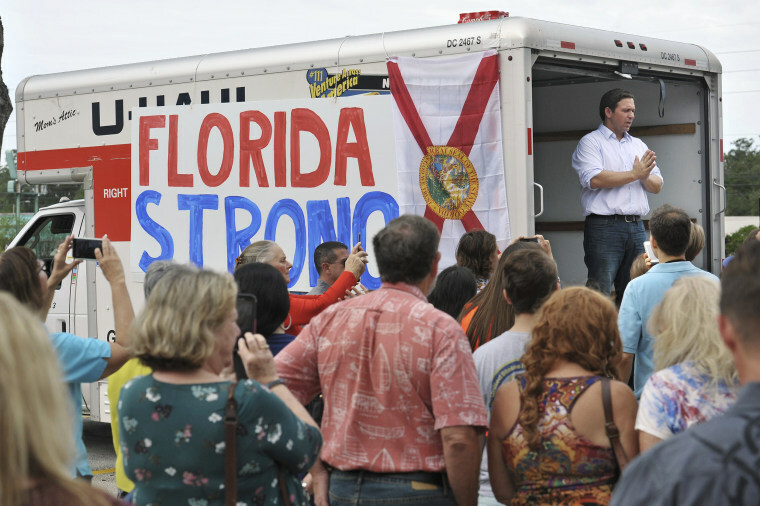 DeSantis' campaign has not directly responded to questions about whether it had temporarily suspended its campaign activities, although the campaign has shifted veterans events to focus on collecting relief supplies for hurricane victims. According to The Tampa Bay Times, DeSantis nevertheless attacked Gillum during one campaign event on Tuesday. Responding to criticism about not having pulled ads during the hurricane, DeSantis told the paper that "you run your campaign the way you run your campaign. It is what it is." "We've had all this planned out long before, and we're going to stick with our plan so people will see that unfold in the next day or two,” he said. DeSantis, a former congressman representing the Jacksonville suburbs, resigned his seat last month to focus on his campaign — meaning he no longer has any official role to play in this storm. Meanwhile, Gillum, the mayor of Tallahassee, told MSNBC Wednesday that he had canceled campaign-related events because of the storm. "I've been here at the emergency operations center since the beginning of this storm event, canceling all of my campaign-related events to be back here to do my job to ensure that we're making the proper preparations," Gillum said. Gillum has also attacked DeSantis for keeping negative ads on the air during the hurricane. "It's unfortunate Ron DeSantis wants to keep politicizing things that shouldn't be partisan — like caring for veterans or hurricane response," campaign spokeswoman Carlie Waibel told The Tampa Bay Times. Ali Vitali and Mark Murray contributed.